Terrific Scientific is an ambitious campaign from the BBC with the goal of inspiring primary school pupils to discover their inner scientist. Currently, fewer than 15% of 10-14 year olds aspire to pursue a career as a scientist, leaving the UK with a potential skills shortage. This campaign has been introduced to empower teachers to deliver engaging and inspiring science lessons, aiming to reach around a million pupils and 30,000 teachers. As well as guiding teachers and pupils through investigations step by step, the website is packed with extra resources for each topic. LCR Hallcrest were approached by the BBC to produce an interactive Thermometer as part of an investigation that would look specifically at energy and temperature. 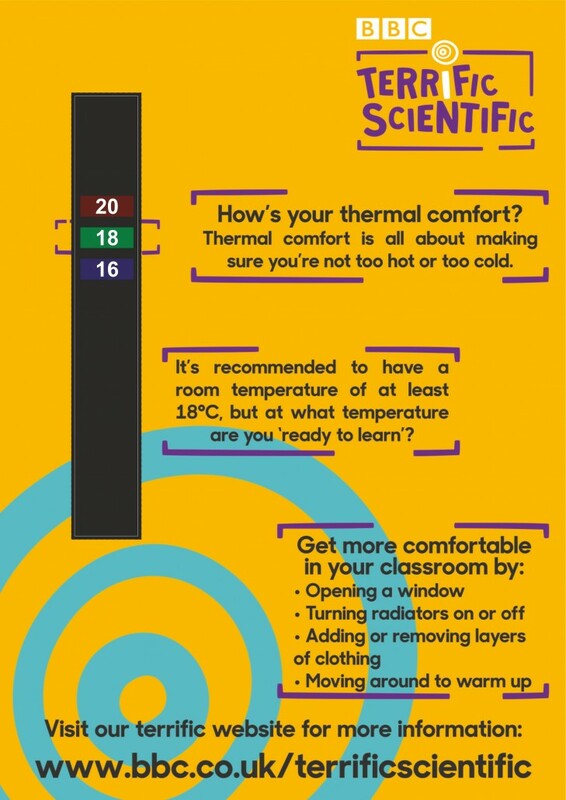 The thermometer would be used by teachers in the classroom to deliver lessons on thermal comfort and to helping pupils understand the importance of being too hot or too cold. The custom backing card was printed using a palette of 5 chosen colours that would connect with the Terrific Scientific theme. A standard Liquid Crystal 9-27C colour changing thermometer was attached to the card and each temperature range had explanation making it easy for the teacher to describe the difference in detail.